A new special exhibition opens today at The Beatles Story, celebrating 50 years since The Beatles travelled to Rishikesh, India. 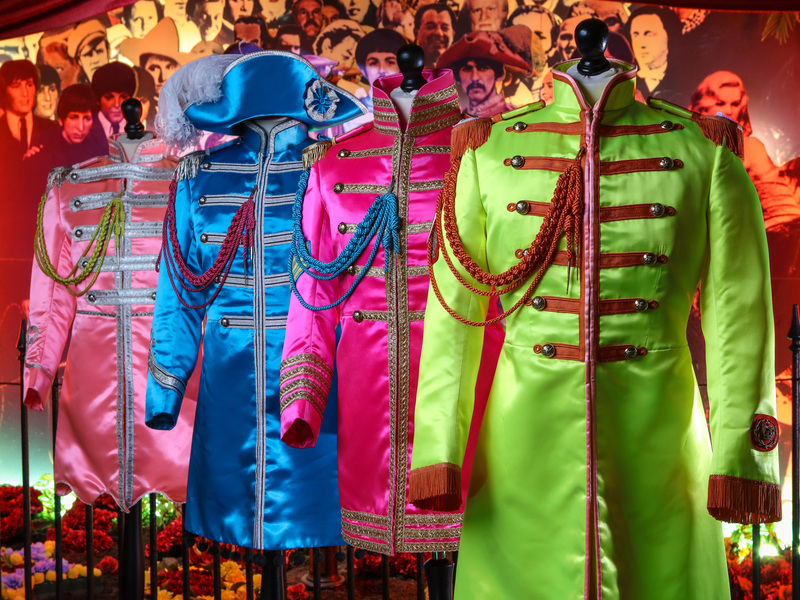 ‘Beatles in India’ is a new one-of-a-kind exhibition, exploring this key and relatively secretive episode of the Beatles’ story with memorabilia, imagery and exclusive personal accounts from the people who were there with the band in 1968. A sitar used by Ravi Shankar is on display within the new immersive area, loaned to The Beatles Story by the Ravi Shankar Foundation, he referred to this instrument as ‘Shyama’. As George Harrison’s mentor, Ravi’s influence on the Beatle ultimately helped to popularise the use of Indian instruments in 1960s pop music. Ravi used this particular Rikhi Ram sitar mainly for practice and composition work, it was the twin to ‘Black Beauty’ and is taken directly from his personal regular stable of sitars. The exhibit also includes photography from Paul Saltzman, a sound engineer for the National Film Board of Canada at the time, who photographed The Beatles during their stay. He is responsible for some of the most iconic and intimate images of the Fab Four in India. A collection of Paul’s limited edition signed prints are available to view within the exhibition, as well as a life-sized version of his famous image depicting the Beatles with their entourage and Maharishi Mahesh Yogi. Pattie Boyd, former wife to George Harrison, and her sister Jenny Boyd, who were amongst the star-studded list of attendees in India, provide their personal insight into the time through exclusive video interviews. The interviews explore the groups’ inspiration for the trip, their introduction into Transcendental Meditation, the songs they worked on in advance of the White Album and some of the controversies surrounding their visit. Speaking about her involvement, Pattie Boyd said: “I am delighted to have been invited to be a part of The Beatles Story’s new ‘Beatles In India’ exhibition, marking the 50th anniversary of the trip to Rishikesh. It really was a special, magical time; forming many memories and, of course, an abundance of great Beatles music. I look forward to sharing thoughts and memories of India as part of the exhibition”. 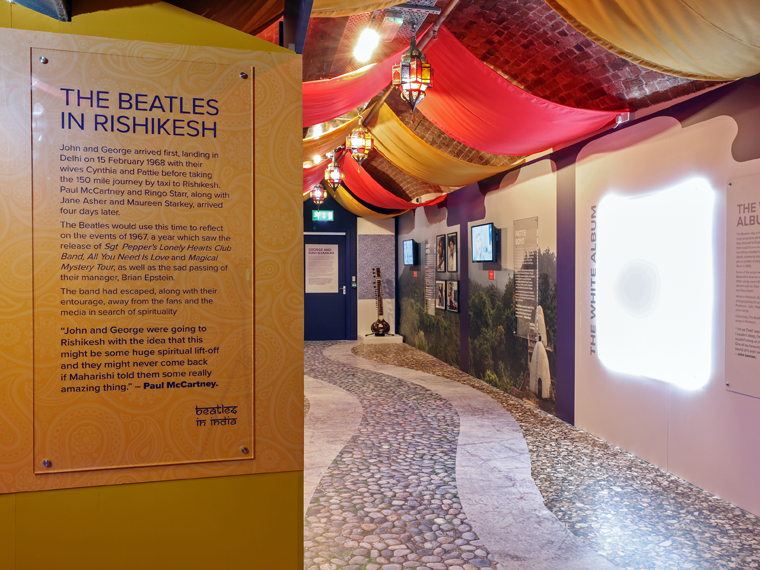 Themed areas within the exhibition encompass some of the authentic colours, sounds and smells of Rishikesh so that visitors can really get a sense of what it was like for the Beatles. 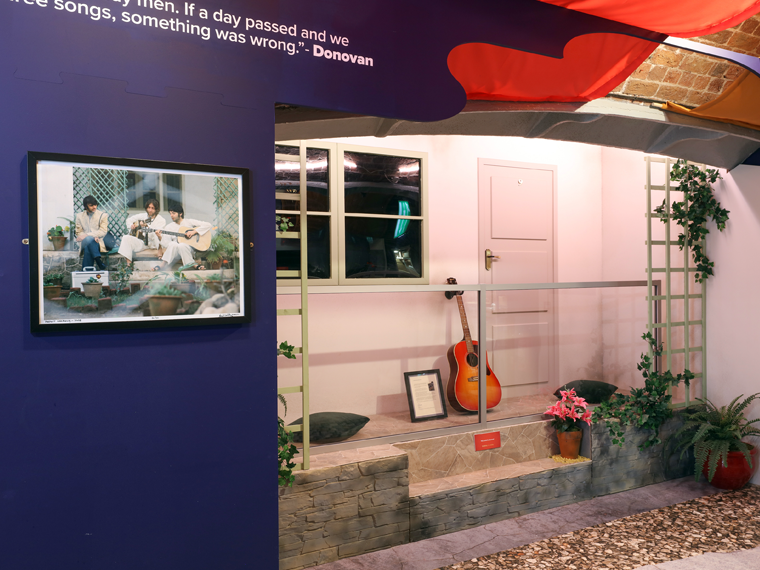 ‘The Bungalow’ set provides insight into the Beatles’ living quarters, an area used by the attendees for song writing. It features a 2014 signature version of Donovan’s Gibson 1965 J-45 acoustic guitar, along with an autographed label and personal letter from the singer-songwriter. 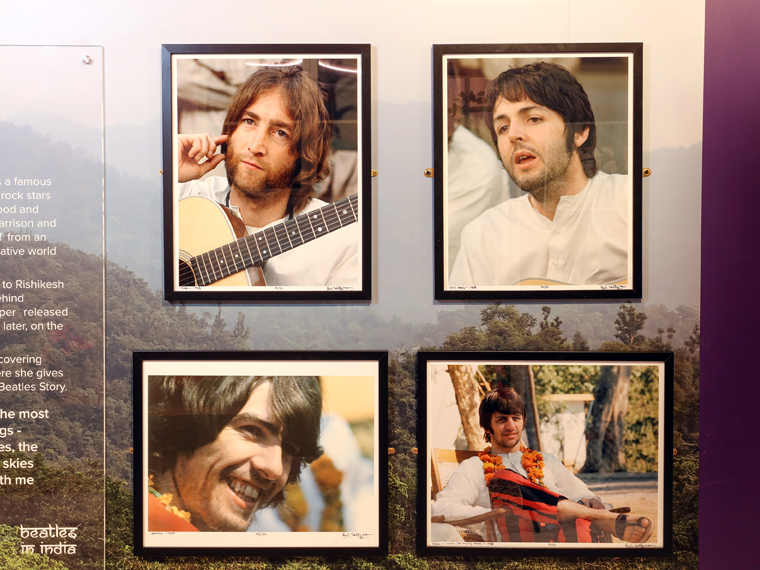 Diane Glover, Marketing Manager at The Beatles Story, visited Rishikesh in April 2017 and went to the Maharishi’s Ashram, which is now open as a tourist attraction. She said: “Visiting Rishikesh, ahead of the 50th anniversary of The Beatles staying there, was wonderful. The remains of the Maharishi’s Ashram, overlooking the Holy River Ganges, still stand and it is clearly a place of peace and seclusion. “The 1968 visit was an important time of reflection for The Beatles as their manager, Brian Epstein had sadly passed away in the summer of 1967, and they escaped away from their fans and the media in search of spirituality”. ‘Beatles in India’ will be one of the highlights of 2018, a year in which Liverpool celebrates its fantastic cultural offering, ten years after the city was awarded ‘European Capital of Culture’ status. February 2018 also recognises what would’ve been George Harrison’s 75th birthday – the Beatle celebrated his 25th birthday with friends at the Ashram. Celebrations for this will form part of a year-long programme of unique Indian-inspired events, including workshops and Q&A sessions. ‘Beatles in India’ is now open as part of The Beatles Story, based on the Albert Dock in Liverpool. The exhibition will run for two years. 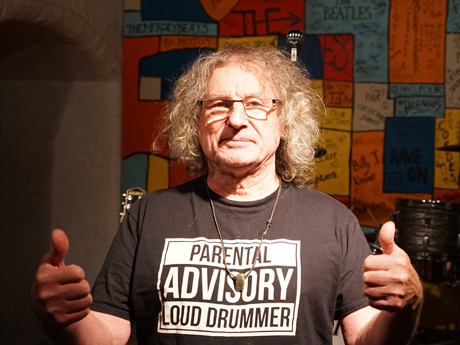 Don Powell, drummer for English glam rock band Slade, and long-time fan of Ringo Starr visited The Beatles Story today. 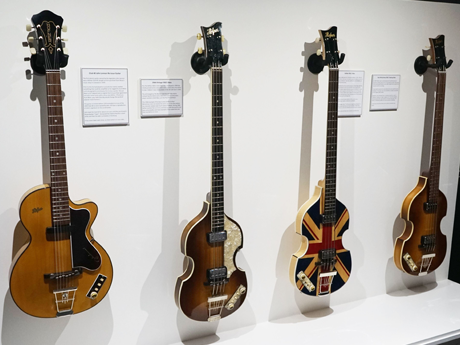 Guitar brand Höfner has loaned four one-off replica guitars used by Paul McCartney and John Lennon to the Beatles Story, Liverpool. 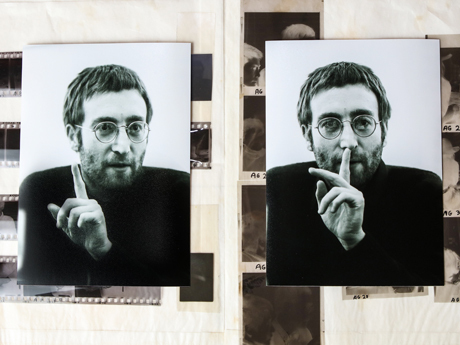 A collection of 26 negatives containing rare never before seen photographs of John Lennon from February 1970 have been uncovered at The Beatles Story.